Verruca Treatments – Verruca is a contagious virus that seems to thrive in damp conditions such as swimming pools, showers and bathrooms. The common treatments for verruca are gels or ointments from the chemist. However, these treatments can burn the surrounding skin if not used with care. Verrucas can hide successfully from being detected by your immune system. It is important to maintain a strong immune system in order for any verruca treatment to be successful. However, we also need to inform the body that the verruca virus has invaded our skin. Our clinic is equipped with the latest Cryosurgery system. We use liquid nitrogen to freeze the infected area of tissue down to such a low level that the verrucae virus is killed. The tissues actually form ice crystals for a short time after treatment. A light, dry blister usually forms over the following 2-3 days. We review the area every 2 weeks and further treatment is delivered as necessary. We also offer the option of using 60% Salicylic Acid with or without Monochloracetic Acid crystals on the affected area. The area is masked to avoid damage to the surrounding skin prior to the application. You will need to keep your foot dry for 2-3 days to give a chance to the acid to break down the verruca tissue. You will need to return to the clinic after 2-3 weeks for a review and further treatment. In the majority of cases, a course of minimum 5 treatments is normally required, especially if you have had verrucas for longer than 2 years. Hyphrecator 2000 from Conmed is the very latest development in electrosurgery. It has the ability to dry out the verruca cells and fulgurate the area (causing a burn to the tissue to destroy the verruca). The size and location of the verruca will dictate what method the podiatrist will use to anaesthetise the foot. Typically the lesion will resolve within a few days of the treatment with very little after care required. Falknor’s Needling also requires the area to be numb prior to the procedure. The verruca is pierced multiple times so that tiny verruca cells can be transferred into the deeper tissues (the dermis). In the dermis, the verruca virus can be detected more efficiently by the immune system and eradicated. This procedure has higher success rates than any other method used to treat verrucas. Patients experience very little post op pain and the area heals up fully after a few days. In some cases, a second procedure may be required. Either method has proven to be highly successful. At Medipod Clinics, we have reached a fantastic 90% success rate on verruca resolution. 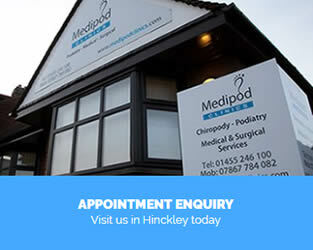 For more information please see our Surgical Podiatry Services page.